Serenity, Virtual Modular Synth from HG Fortune. Serenity is a synthesizer aimed to create various choir and string pad sounds but it is not meant to emulate this or that vintage string and/or choir machine. The internal waveset has been selected to provide you with a range of string, choir and vocal waves plus some more complex padsounds. Most of these waves have been processed widely from prior versions and several new waves have been added. 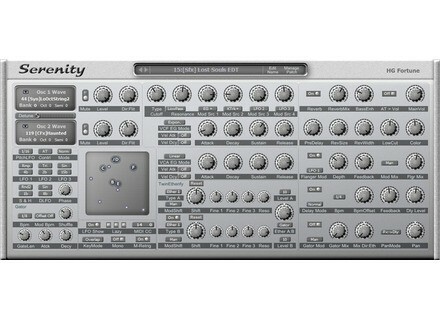 Serenity Pro is available at an introductionary offer with 36% off for 24,50Euro/34U$ only until July, 3rd 2011. Regular price after that will be for 39 Euro. Free version: 3 voices, no internal patch management, no MIDI Learn, no velocity control on Attack / Decay of VCF / VCA EG, no SF2 Load, less patches (4 banks), but a hidden easter egg gimmick. Sound Magic Ruby Piano3D Sound Magic releases Ruby Piano, a Yamaha Concert Grand using NEO Hybrid Modeling Technology.